Visit the Burj Khalifa ‘At The Top’ observatory and see Dubai’s Musical Fountain show on a sightseeing tour with an expert guide. Travel to Dubai Mall, the region’s largest shopping mall, and view attractions such as Dubai Aquarium and the Souk Al Bahar, the Arabic-style mall overlooking Lake Burj. Take an elevator to the 124th floor of the Burj Khalifa, and enjoy ample time to absorb the bird’s-eye views over the city. 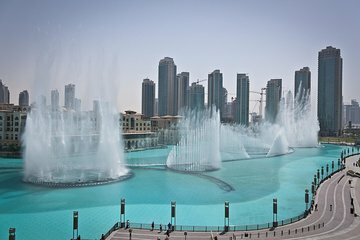 Cap everything with a dazzling Musical Fountains show on Lake Burj, seeing the multi-colored fountains dancing to music. This express tour whisks you to the Burj Khalifa, Dubai Mall and Dubai Fountain, all in two hours or so.